The latest update of the Labor Market Conditions Index for June is at 1.5, down from May’s revised 3.3. 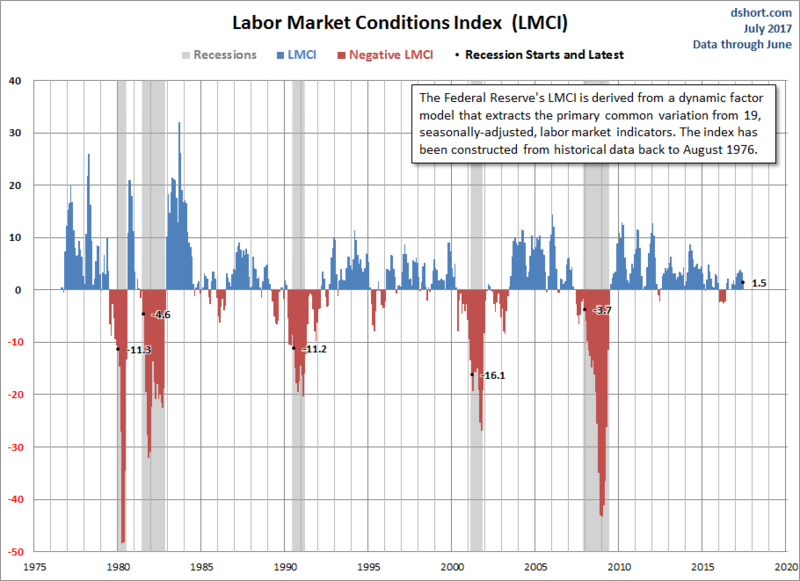 The LMCI is a relatively recent indicator developed by Federal Reserve economists to assess changes in the labor market conditions. The cumulative index (discussed below) is currently at its post-recession peak. As we readily see, with the exception of the second half of the double-dip recession in the early 1980s, sustained contractions in this indicator is a rather long leading indicator for recessions. It is more useful as a general gauge of employment health. 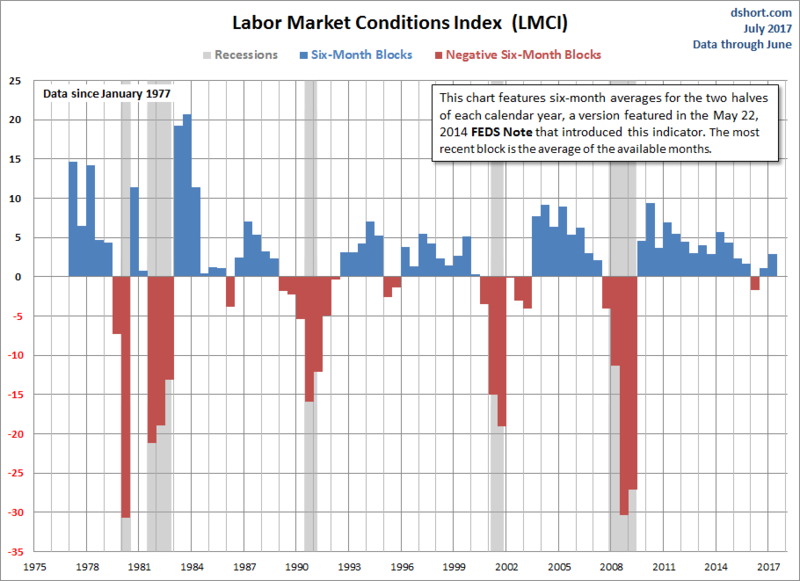 Note that in the most recent FOMC minutes for March 14-15, the phrase “labor market conditions” was used ten times. Maximum employment, after all, is one of the Fed’s twin mandates. Interestingly enough, the May 2014 announcing the indicator doesn’t chart the complete series with monthly granularity. Instead, the authors use a column chart to show blocks of six-month averages for the two halves of each calendar year since 1977. This approach further supports the use of the indicator as a general gauge of health. Here is our larger version of the same graphic model. We couldn’t resist the urge to create a chart of the more conventional six-month moving average of the indicator. Note that we’ve adjusted the vertical axis to capture the depth of the contraction during the last recession. The LMCI hit its interim high in April 2014 and its six-month MA high four months later in August of that year. 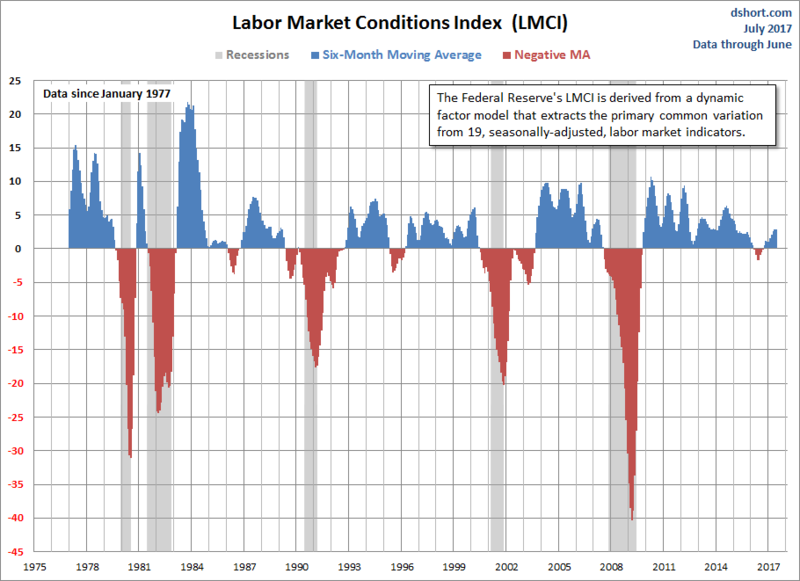 As all three charts above illustrate, labor market conditions were weak for most of 2016, but picked up in late 2016 into 2017.